It may seem that building a marketplace startup isn’t as difficult as building some other web apps. Technically speaking, that’s true. However, when it comes to marketplaces, you face a range of other issues that can kill your product from the very beginning. What model should you choose? How will you attract sellers and buyers? How will you retain them? All these questions are crucial and require careful consideration. In this post, we’ll cover the four most important questions and share our ideas about how to answer them to help you create a successful marketplace from scratch. Question 1. Vertical or horizontal marketplace? It’s best to make sure that you understand the differences between a vertical and horizontal marketplace and that you know the strengths and weaknesses of both options before you make your final decision. Vertical marketplaces are focused on one specific sphere or niche. They can be industry-specific or demographic-specific. Vertical marketplaces usually have specialized knowledge and targeted insights. They have a narrower customer base, so it’s easier for them to create highly targeted and cost-effective marketing campaigns. Easier to build a successful marketing campaign. The customer base of a vertical marketplace is much narrower than for a horizontal marketplace. This allows you to focus your marketing strategy and save a lot of money. More value for customers. As a vertical marketplace, you can provide targeted insights and specialized services to customers and become their business partner. Vertical marketplaces specialize in unique and one-of-a-kind products that are difficult to find elsewhere. Vertical marketplaces with unique goods can charge higher rates and get a bigger profit from a smaller customer base. Better quality of goods and services. With fewer products, it’s easier for a platform to maintain and improve the quality of goods and services and moderate ads. Fewer customers and fewer transactions. This is the biggest and most obvious disadvantage of a vertical marketplace. Because the website has less traction and cash flow, revenue increases not with a growing number of users but with a larger fee per transaction. Knowledge of the niche is required. To offer the best conditions for sellers and buyers and provide both parties with real value, a platform needs to have deep knowledge of the niche. It’s best to choose a niche you’re familiar with and have some real-life experience in. If the niche is new for you, you’ll need to conduct comprehensive research on the target audience, its needs, and its pain points. Horizontal marketplaces work with different categories of goods and services for different groups of people. 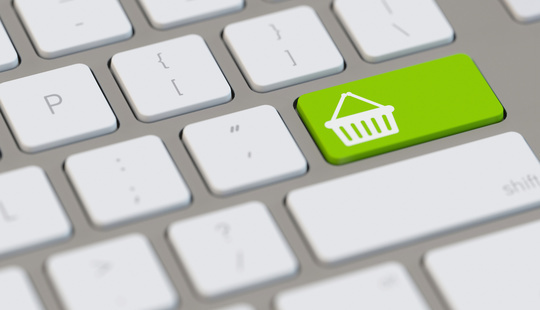 These platforms offer commonly used goods that are in wide demand. In this way, horizontal marketplaces protect themselves from low demand and guarantee a large target audience, which means more transactions and more profit. Usually, these marketplaces feel severe competition. Lower costs. In a horizontal marketplace, all sales are streamlined and have one standardized model. This unification allows you to cut costs dramatically. Bigger audience. Horizontal marketplaces are trying to attract as many people as possible. The everyday goods that these platforms offer can be sold across a large territory or even worldwide. More transactions. A bigger audience means more transactions and better profit for the platform. Huge competition. There are a lot of large horizontal marketplaces that sell a wide variety of goods for everyone. For a young company, it’s difficult to enter the market and attract enough sellers and buyers. Difficult to build a solid marketing strategy. Since the audience of a horizontal marketplace is very diverse, it’s difficult to create a marketing campaign that will fit specific groups of people. Marketing campaigns for horizontal marketplaces don’t allow you to easily collect data and track analytics efficiently. Difficult to build trust and support customers. 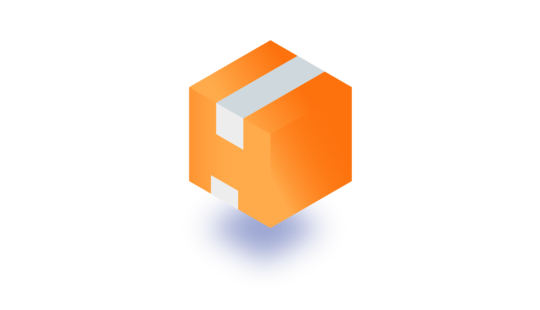 When you deal with a large number of customers and a large number of goods, it gets difficult to provide sufficient customer support and build trustful relationships among the platform, buyers, and sellers. Difficult to create value for sellers and customers. There are so many horizontal marketplaces that offer great conditions for sellers and buyers, convenient tools, and an easy user journey that it will be difficult for you to stand out and compete. So what type of marketplace should you choose? If you have a great idea for a horizontal marketplace that will make your platform 100 percent unique and can provide real value for both sellers and buyers, you should choose this type. But don’t forget about hundreds of huge competitors that have been on the market for decades. A vertical marketplace is much easier to start with. There are still a lot of niches without large competitors. Creating a vertical marketplace, you can build a solid marketing strategy that will allow you to learn more about your audience. Besides, you can always add new categories of goods and go horizontal if you’d like. Question 2. What marketplace model should you choose? 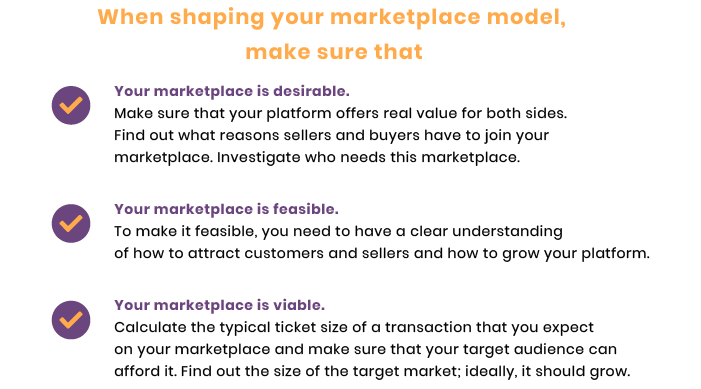 Once you’ve decided whether you want to go with a vertical or horizontal marketplace, you need to think through all other aspects of your product. We’ve made a checklist that will help you decide how your platform is going to interact with all parties, make money, and grow. Here are the things to double-check. By answering all these questions, you shape the future model of your product. A well-considered model solves a range of issues, including the chicken and egg problem (the problem of attracting both customers and sellers). If you already have everything figured out, that’s great. But what if you don’t? In this case, you can use one or several of our tips to test your business idea and come up with a clear vision of the marketplace model you want to build. This is the simplest and easiest way to test your business idea. While performing a SWOT analysis, you need to find out all the strengths, weaknesses, opportunities, and threats of your business idea. We’ve written detailed instructions on how to perform a SWOT analysis in this article. This is the first step. Step number two is to conduct a SWOT analysis of your competitors’ products. By knowing the strong and weak sides of your rivals, you can make your product better and attract new customer markets. We’ve written an article on our blog about the Lean Canvas and how it helps us to evaluate our clients’ business ideas. A minimum viable product (MVP) is a product that has only the most important features of the product you want to build. Developing an MVP takes less time than developing a fully functioning platform. This means you can save time and money and launch faster. For more on this, read our article about MVPs, their benefits, and how to build one. Another great benefit is that an MVP helps you elicit hidden weaknesses and strengths; it can also provide you with tons of insights and analytical data once you release it. An MVP can give you the time and data you need to make your final product perfect. Question 3. How can you engage with users and foster their loyalty? All marketplaces need to have trusting relationships with their customers. Vertical marketplaces have to build even closer relationships with sellers and buyers, as they potentially have a smaller market. Below, we share some tips you can use to foster the loyalty of your customers from the very beginning. “Great marketplaces are built from the niche to the masses,” says Boris Wertz, founder of Version One Ventures, a Vancouver-based early-stage investment firm that was acquired by Amazon in 2008. Wertz advises creating strong relationships with early adopters and only then appealing to a broader audience. When you’ve hooked the most passionate users and satisfied their needs, it’s likely that they’ll recommend you to their friends, family, and followers. When it comes to a horizontal marketplace, customers only need to know that it’s secure to buy and sell there. With a vertical marketplace, you need to create a name not only for being secure but also for being knowledgeable. This means you need to position your marketplace as the definitive authority in your niche and set conditions that will allow you to grow a community of like-minded people to support your product. When you’re building relationships with sellers, you should remember that they may already have an audience of buyers. If you manage to attract such sellers, their buyers can become your customers. Access to an engaged audience is key to building initial traction. Etsy created a strong community of loyal users by allowing vendors to act as evangelists for the platform, delivering a focused marketing push to their respective networks, which offers value over volume. Once you’ve matched your audience and vendors, it’s important to let them communicate with each other. A tool for direct communication is a must-have feature for your platform. Having a direct line of communication shows the transparency of the purchasing process, helps build trust, and ensure that customers return. To prevent yourself from losing vendors, you have to think about how to help them sell more and get more revenue. Consider features such as price alerts, flash promos, exclusive discounts for frequent buyers, and other things that encourage repeat purchases. Help your vendors get more with your marketplace and they won’t leave you even if they can pay lower commission elsewhere. Question 4. How can you build trust on both sides? The only thing that stops people from buying things is lack of trust. When users see a potential threat, they leave a platform. Building trust is long and tiring work, usually in several directions. You have to assure users that they can trust their peers, the products and services provided, and the platform itself. Here’s how you can do it. Implement ID verification and background checks. Almost all platforms already use ID verification via social login to confirm that a user isn’t a bot. However, some services sold via marketplaces (like babysitting and driving services) require a more detailed check. In such cases, a background check is a must. Perform screening. This can be done by phone or face-to-face along with reference checks. The process is time- and money-consuming but is necessary for providers offering services that entail great responsibility. Build a reputation. 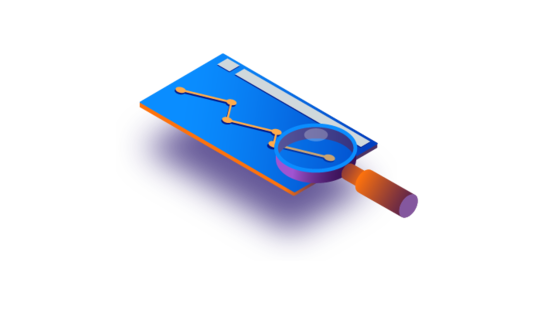 Users can build a reputation with the help of reviews, ratings, job success rates, badges, or hours tracked on a platform. Show users how they’re connected. This is another strategy to show users that they aren’t strangers. Airbnb checks if a vendor and a customer have any mutual friends on social networks. Finding mutual friends helps people trust each other more. Allow users to introduce themselves. People are afraid of strangers. So it’s useful for vendors and customers to tell about themselves to get to know each other. This strategy works for platforms like BlaBlaCar and Airbnb. 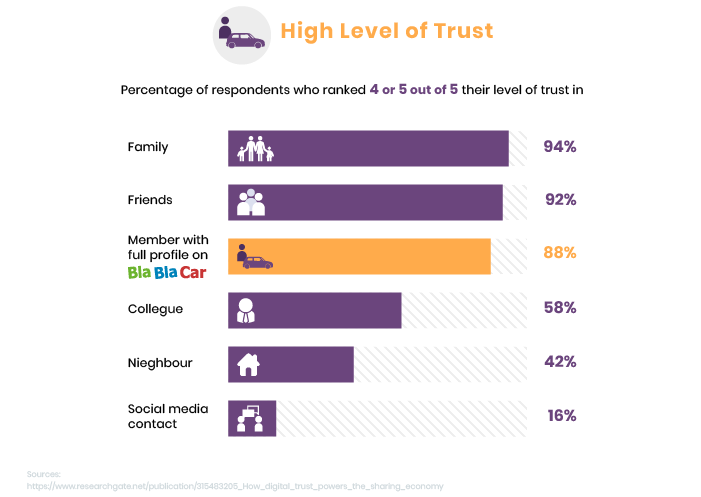 Research by IESEinsight on digital trust in sharing economy has revealed that users trust people with informative profiles almost as much as friends. Verify products with photos. By adding photos, you can make sure ads on your platform can be trusted. Confirm skills and knowledge. Upwork offers freelancers to pass tests to confirm the level of knowledge and skills they indicate in their accounts. Let customers leave feedback. Feedback helps customers understand if a particular service or product met the expectations of previous buyers. Provide customer support. Customer support shows your empathy toward users and improves the customer experience. Set the rules. Your platform’s terms and policies should provide users with a comprehensive idea of what they can or can’t do there. For example, BlaBlaCar has guides on how to be a good driver and how to be a good passenger. If users abuse these rules, they get punished. Secure payments. Use only trustworthy technologies or third-party payment gateways to protect your users and their banking data. If your platform deals with large sums of money, you can consider implementing an escrow feature. With escrow, money on a buyer’s account is frozen and the transaction is performed when the buyer confirms receipt of the product or service. Platforms like Airbnb, Uber, and AliExpress use this feature. Of course, you don’t have to use all these strategies to be credible. Choose the most important things for the type and model of your market and focus on them. To build a viable and successful marketplace startup from scratch, you don’t need to think about thousands of details. Start by thinking through the main aspects that define the shape of your platform and how it will interact with the outside world. We also highly recommend evaluating your startup idea with the Lean Canvas and building an MVP first. Don’t forget to subscribe to our blog to get more insights and tips about startups and how to grow a successful business without having to kiss too many frogs.